David Levine will be joining me on my journey to Standing Rock in order to safely deliver the humanitarian aid supplies collected be Abby Kalainikas, Richard Wilson, and the parishioners of Saint Barnabas Episcopal Church of Leeland, MD. We will be departing towards the end of April to avoid any chance of getting trapped by a snow storm. We wish to thank Mr. and Mrs. Kalaikinas once again for their generous donation and making this mission possible. We are in need of someone whom can assist us in driving our humanitarian aid material to the Standing Rock Sioux reservation in North Dakota. Departure: beginning of April. Total time away should be around 5 or 6 days. Once there you will absolutely love the land and be able to meet my second family, the Bravebulls – descendants of Sitting Bull. Get in touch with us if you are interested. We will be flying back to from Bismarck to Raleigh/Durham International Airport. Today we received all the funds necessary (in excess of $3k) to hand-deliver the humanitarian aid material collected by our SMT program director Abby Kalainikas, as well as Richard Wilson and the parishioners of Saint Barnabas Episcopal church of Leeland, MD, to the Standing Rock Sioux tribe of North/South Dakota. The financial donation was provided by Mr. and Mrs. Kalainikas, Abby’s parents. I and all of the members of The Fishermen International Aid and Relief Nonprofit wish to thank the Kalainikas family for their undying support of our mission to provide aid to people in need. 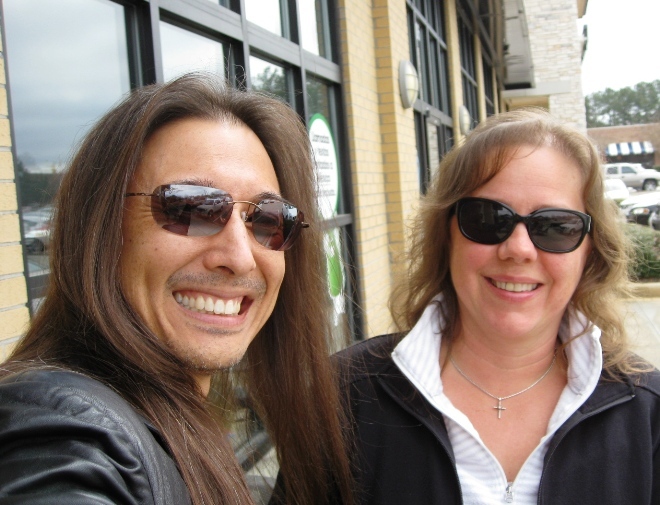 Photo: Me and Mrs. Kalainikas.